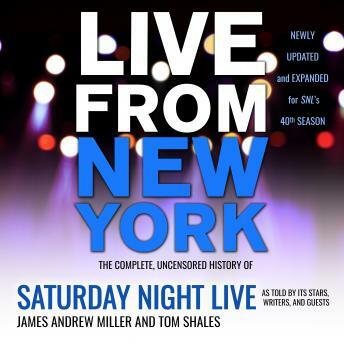 When first published to celebrate the thirtieth anniversary of Saturday Night Live, Live From New York was immediately proclaimed the best book ever produced on the landmark and legendary late-night show. In their own words, unfiltered and uncensored, a dazzling galaxy of trail-blazing talents recalled three turbulent decades of on-camera antics and off-camera escapades. Now a fourth decade has passed-and bestselling authors James Andrew Miller and Tom Shales have returned to Studio 8H. They raucously and revealingly take the SNL story up to the present, adding a constellation of iconic new stars, surprises, and controversies.